Sep 13, 2017: Just bought an LG V20, anything I should know? 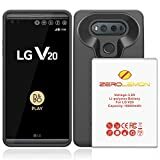 Oct 24, 2017: List the "must have" LG V20 gadgets with links. May 15, 2018: Looking for a specific battery case.